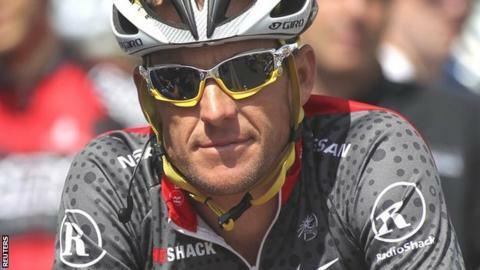 Olympic gold medallist and USA cycling coach Jamie Staff believes Lance Armstrong has been made a scapegoat over drug-taking in the sport. The United States Anti-Doping Agency labelled Armstrong a "serial" cheat in their recent report on the 41-year-old. He has also been stripped of his seven Tour de France titles by the sport's governing body, the International Cycling Union (UCI). "He's been kind of a scapegoat really," Staff told BBC South East Today. "A lot of people have done it, probably everyone in his generation. "If you wanted to finish the course you had to jump on board." Armstrong has always denied doping, and did not contest Usada's charges, while his lawyer described the report as a "one-sided hatchet job". Many within the cycling world have condemned the Texan, with UCI president Pat McQuaid saying: "Lance Armstrong has no place in cycling. He deserves to be forgotten." But Staff, who moved to track cycling after a highly successful career in BMX, says the recent revelations over fellow cyclists' doping admissions point to widespread abuse within the sport. "He seems to be the one everyone is picking on, probably as he was the most successful. "It was unfortunate, it was just a generation or a few generations who chose to take drugs to basically enable them to recover quicker," Staff continued. "What we're hearing from a lot of people speaking up about it, they just feel so relieved to get that burden off their shoulders. They don't care what results get taken away, they just don't want to hold that in any more." Ashford-born Staff, who won team sprint gold in Beijing alongside Chris Hoy and Jason Kenny and now works in California developing the American track sprint cycling programme, believes the sport will survive the revelations. "I'm sure it will hurt the sport for a little while," he said. "There is a new generation. Have faith that the likes of Bradley Wiggins are clean - I'd bet my life on it. "I'd be happy to say any GB athlete is clean."